Join us on the beautiful island of Hawaii as we swim and play in the tranquil turquoise waters with the friendly resident spinner dolphins that often congregate along the coast in pods numbering hundreds of dolphins. 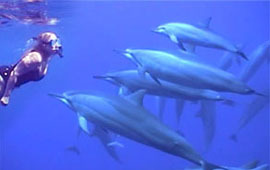 On some occasions we may also swim with spotted dolphins, bottlenose dolphins and manta rays. From aboard our boat we may also explore and seek out encounters with pilot whales, humpback whales, and other dolphins and whales that frequent the Big Island. Experience the exhilaration and excitement of contact and communication with our cetacean friends in the wild. It can be a life-changing experience! All reservations must be made with April prior to payment. Please click here for more information before making your reservation. Due to the nature of the dolphin and whale workshops, we are not able to offer disabled accessibility. If you have any questions, please email us prior to booking your travel.